This arpeggio concept can help separate you from the well-worn path many shredders tend to follow. Hovering in the abyss of time and space, of metal and glory, of dragons, mythical kingdoms and guitar picks lost in the couch, is another plane where scales and arpeggios intertwine as one musical and universal entity. Upon the completion of a 72-hour straight practice session and a Steve Vai-approved fasting, I’ve returned from this realm to pass on the following knowledge. If you are still with me after that bit of esoteric nonsense, it is time to put on your thinking pants and buckle up, because it is going to get theoretical in here for a minute. If we rearrange the notes of a major scale in thirds, or by skipping every other note, they assume the form of a longer arpeggio. In jazz, the 2, 4 and 6 are renamed as 9, 11 and 13 (up an octave) and are the basis for extended harmony. Laying this out on the fretboard creates a unique sounding five-string arpeggio shape that is playable in two different configurations (EXAMPLE 1). We can then apply this process to all seven modes of the major scale (EXAMPLE 2). I remember seeing an old article where Joe Satriani referred to these as “modal arpeggios." In the same way that each mode has it’s own sound and flavor, each of these arpeggios have their own sonic possibilities. An alternative way to think of these would be as a pair of chords, one triad and one seventh chord. 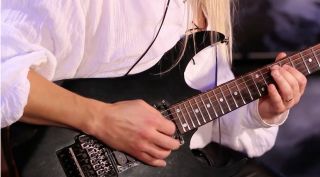 Taking the G Lydian arpeggio from EXAMPLE 2, with the total collection of notes being G, B, D, F#, A, C# and E, two different pairs of chords emerge (EXAMPLE 3). This can be seen as a Gmaj7 and an A Major, or as a G Major and an F#m7. Dividing this set of notes up differently can considerably affect choices of phrasing and arpeggio shape. Most guitarists tend to think of scales and arpeggios as two distinct musical concepts. Since these new arpeggios are just rearrangements of full scales, that means they can be used interchangeably with scalar runs. The best part about EXAMPLE 4 is its versatility and ambiguity. All of the notes belong to G Dorian (or F Major), meaning that it could conceivably fit over any of the chords in that key. D minor, G minor or Bb Major would sound particularly cool. EXAMPLE 5 could work well over an E7 to A chord pattern, or moving from B minor to C#7 as iv-V in the key of F# minor. Alas, we have arrived at some full six-string arpeggio shapes. As an added bonus, they are patterns with considerably greater harmonic depth and color than the well-worn and pedestrian sounding triadic shapes that most shredders perpetually use. Keep experimenting with bits of this arpeggio concept to distance yourself from the guitarists in the other barbarian hordes out there. Stay metal until next time.